Peru is a large, mountainous country straddling the equator on the Pacific coast of South America. 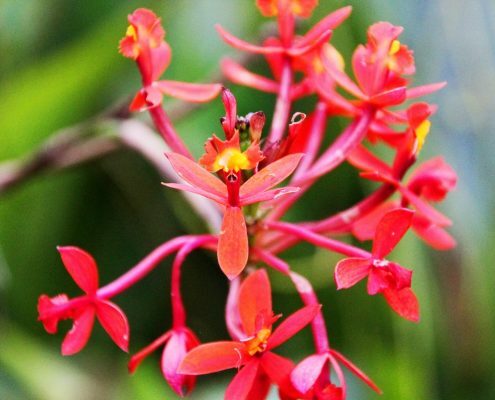 It borders with Ecuador and Colombia to the north, Brazil and Bolivia to the east and Chile to the south. There are four natural zones running roughly north to south: Costa, Sierra, Montana and Selva. The Costa Region, where the capital, Lima, is situated, is a narrow coastal plain consisting of wide expanses of desert cut by fertile valleys. The Sierra region contains the Andes mountains with peaks reaching over 20,000ft, most of the country’s mineral resources and the greater part of its livestock. The Montana, an area of fertile, subtropical highlands, lies between the Andes and the rainforests of eastern Peru and remains predominantly undeveloped. 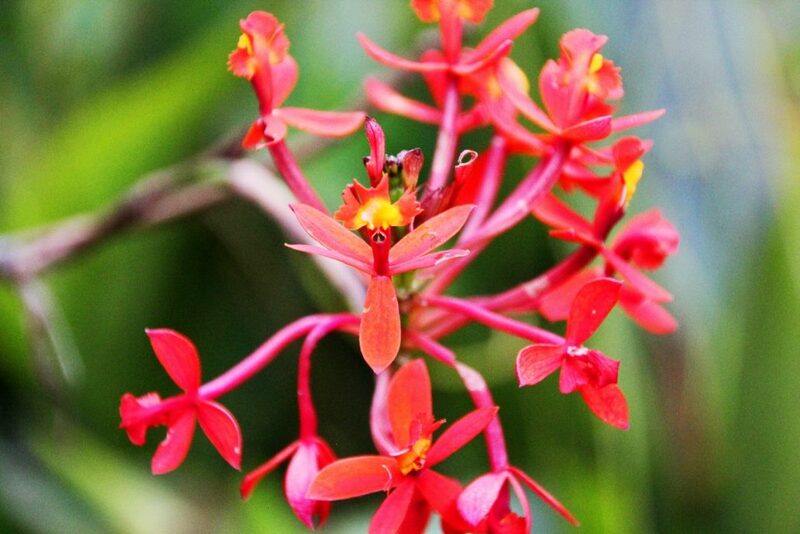 The Selva, or Amazonian jungle of eastern Peru, has innumerable natural resources. 1,285,216 sq km (496,225 sq miles). Spanish and Quechua are the official languages. Aymará is spoken in some areas of the region of Puno. Many other dialects exist in the jungle regions. English is spoken in major tourist areas. 89 per cent Roman Catholic, 7 per cent Evangelical and 4 per cent other denominations. 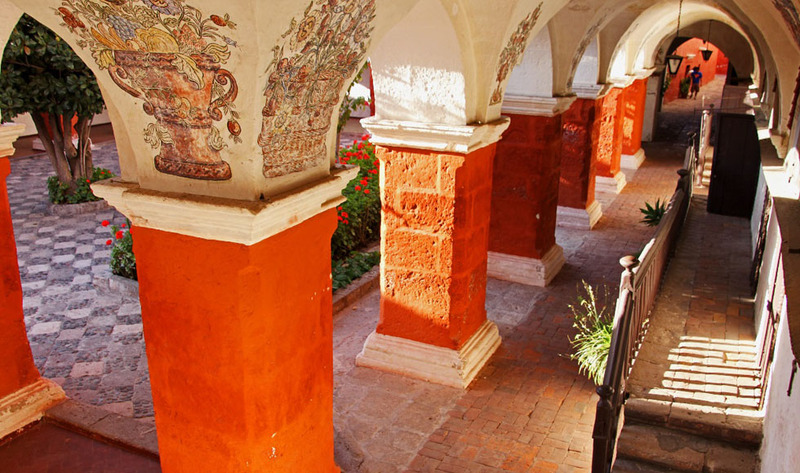 Arequipa, known as ‘White City’, has both Spanish colonial and Andalusian influences in its charming architecture. 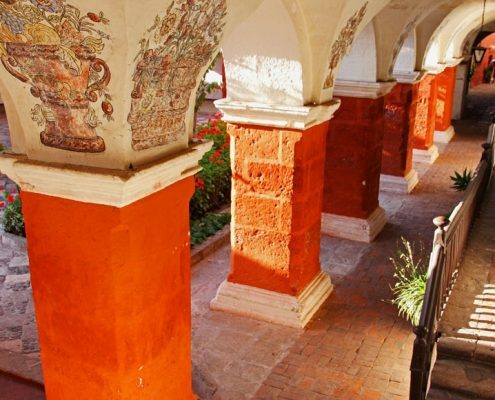 Particularly recommended is a visit to the Santa Catalina Convent – a beautiful ‘city within a city’. 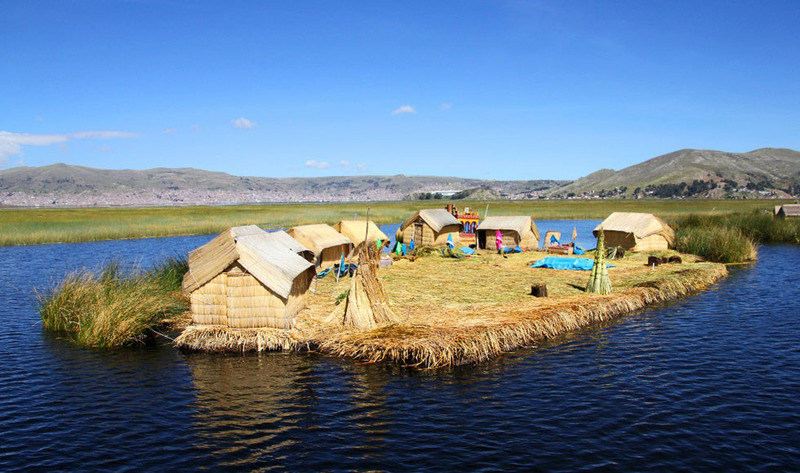 Puno is situated on the Collao Plateau over 3800m above sea level and is the greatest centre of Peruvian folklore tradition with beautiful alpaca wool textiles, local pottery and silver artefacts. 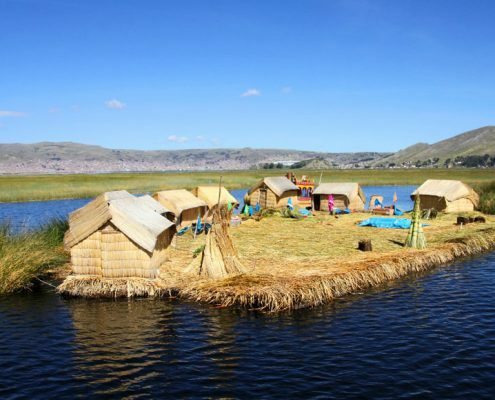 Lake Titicaca is the highest navigable lake in the world, where local Uru continue to dwell on and make their living from the lake. 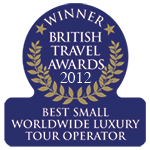 At 3500m above sea level, Cusco was the capital of the Inca Empire. 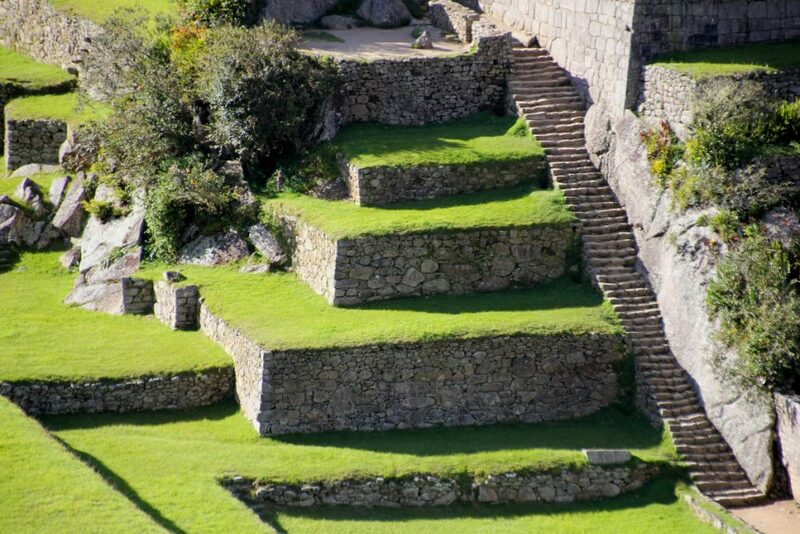 Remains of granite stone walls of the Inca palaces and temples can still be seen, the most notable of which is the Coricancha, or Second Sun Temple. The Cusco Market is also an attraction of the area. Overlooking Cusco is the immense ruined Fortress of Sacsayhuaman. 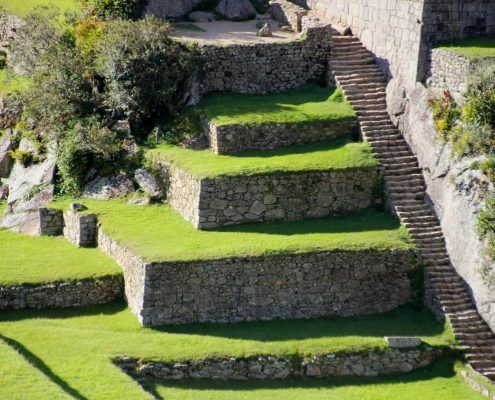 Machu Picchu can be reached from Cusco by train or by foot on the three day long Inca Trail. Best viewed at dawn or dusk, Machu Picchu is claimed by many to be the Eighth Wonder of the World. Both Ica and Nazca have treasure houses containing pre-Inca primitive objects. Take a light aircraft flights over the Nazca Lines – enormous drawings in the arid terrain surrounding Nazca which have caused much speculation among archaeologists. Ayacucho is known as the ‘town of a hundred churches’. It is famous as a source of handicrafts including pottery, leather work, textiles and jewellery. Lima, Peru’s capital, is an ancient Spanish city founded by Pizarro and known as the ‘City of Kings’. The city’s splendid museums, galleries and monuments live side by side with modern suburbs containing the new banks and businesses of an emerging third-world nation. The Amazon Basin covers more than half of Peru, and the jungle is mainly accessed by plane to Iquitos, the most important city in the jungle. Launches regularly take passengers to visit the areas inhabited by the Amazonian Indian tribes. It is also possible to fly to Puerto Maldonaldo, capital of Madre de Dios Department and from there travel to a jungle lodge. Peru – land of extraordinary remains of ancient civilisations filled with wandering llamas, dry sandy coastlines, teeming Amazon jungles and soaring mountains. 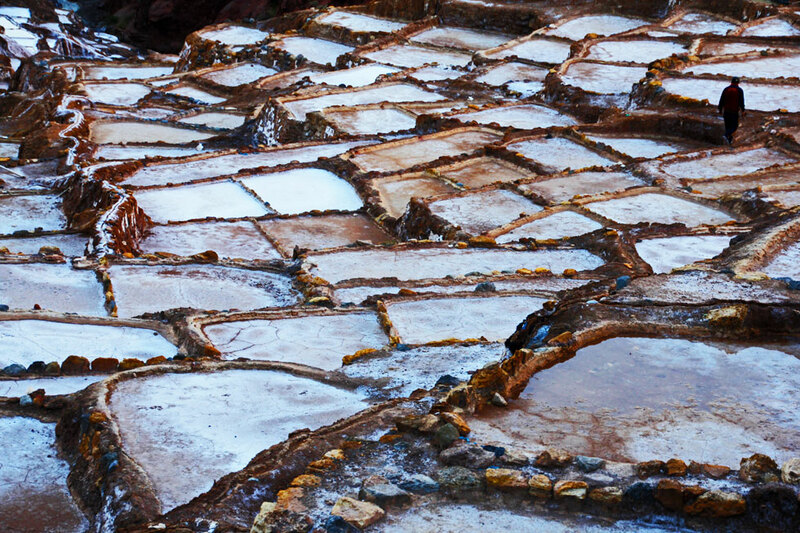 Geographically speaking, Peru has it all. Combine its stunningly diverse landscapes with the soothing sound of pan pipes, the flushed cheeks of friendly highlanders clad in brightly patterned fabrics, the sumptuous flavours of ceviche and ripe avocado, and you have the perfect travel destination. 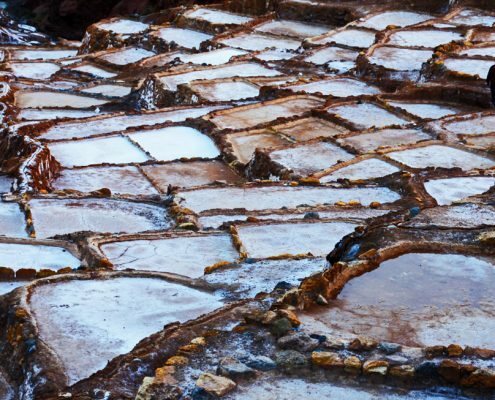 If you are looking to discover a world of weird and wonderful wildlife, spend a week in the surf or an action packed trek to some of the world’s most fascinating ruins, Peru is the place for you. The indigenous Inca civilisation of what is now Peru was conquered by Spain in the early 16th century. The city of Lima was founded in 1535 and Spain ruled the country until the early 19th century, using the rich silver reserves to finance its costly imperialist struggles with France, England and The Netherlands. After the 1821 declaration of independence was challenged by the royalists, the new government appealed for assistance to the revolutionary leader Bolivar who arrived from Colombia. The royalists were defeated at the Battle of Ayacucho in December 1824, after which Bolivar became Head of State. The first of Peru’s military coups was in 1914. The junta lasted five years, before giving way to the civilian Government of Augusto Leguia. Between 1919 and 1930, despite rampant corruption, Leguia instituted important reforms in education and social services. His tenure ended with another military take-over. While the military has always been a powerful force in Peruvian politics, its principal opponent and the country’s largest political party for much of the 20th century has been the Alianza Popular Revolucionaria Americana (APRA), founded by Dr Victor Raul Haya de la Torre in 1924, as a continent-wide anti-imperialist movement, although increasingly moderate and Peruvian-centred in its appeal. APRA has nevertheless been illegal for much of its history. Civilian administrations from 1963-67 and 1980-85 were headed by right-wing President Belaunde Terry of the Accion Popular Party, although APRA was usually the largest party in the Chamber of Deputies. Under Alan Garcia, APRA took power for the first time in 1985. Garcia’s administration was a failure on both the political and economic front. On the political front, Garcia was faced with the continuing growth of the Maoist guerrilla movement, Sendero Luminoso (Shining Path), which benefited substantially from the deteriorating economic situation. The failure of the Garcia Government froze APRA out of the 1990 Presidential election, which then developed into a 2-way race between Mario Vargas Llosa, the world-renowned writer who led the Democratic Front coalition, and the comparatively unknown independent centrist candidate, Alberto Fujimori, an agricultural engineer of Japanese extraction, who was the surprise landslide winner. On April 5, 1992, with the backing of the security forces, Fujimori staged a constitutional coup; congress was suspended indefinitely and the entire judiciary sent on leave pending ‘reorganisation’, with Fujimori ruling by decree. Accusations of corruption and human rights violations forced his resignation in after controversial elections in 2000. Since the end of the Fujimori regime, and through an unexpected period with Alan Garcia back in power, Peru has tried to fight corruption while sustaining economic growth. The country faces a number of challenges: whether to invest in developing areas of the Amazon basin, how to deal with the resurgence of Sendero Luminoso around Ayacucho and the continuing chasm that exists between rich and poor, indigenous and white people. In 2011 Ollanta Humala, the first leftist president since Juan Velasco Alvarado, was elected, defeating Keiko Jujimori (daughter of Alberto). 2016 saw Pedro Pablo Kuczynski come to power championing the indigenous peoples’ rights.